For thirty plus Christmas’ I’ve led groups of carolers. I can’t carry a tune. But I understand the importance and value of singing. Particularly when singing to those among us who are feeling vulnerable. First Baptist in Beverly, sharing the love. 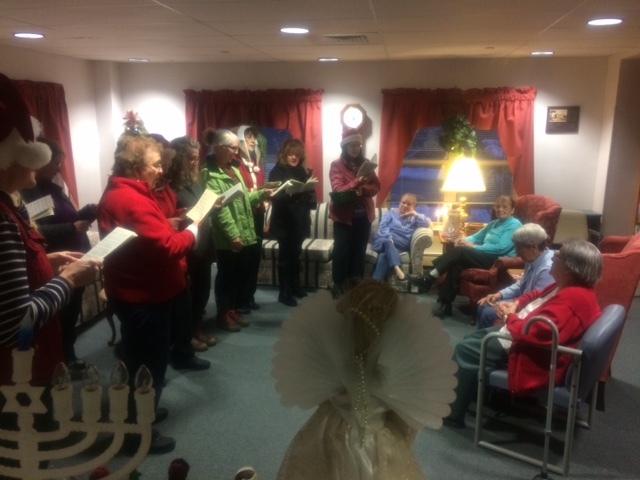 We sing in nursing homes, memory centers, jails, retirement communities and on street corners. We sing to folk who have lost a loved one. We sing to encourage neighbors wrestling with addiction. We sing to remind people that they are not forgotten. To remind ourselves and those we sing for, that as dark as any given moment may seem, that the light will come. To lift up and celebrate the beauty found in community and mutual care. The people who sat in darkness have seen a great light, and for those who sat in the region and shadow of death light has dawned. Matthew quoting words from the prophet Isaiah, reminds us that the embodiment of this light is Jesus. It is this light come to earth in the story of Jesus, which inspires us to sing, to hope, to persevere. Christmas is often a difficult time for people. We have so many expectations of what the season should be…family, gifts, comfort, joy, peace. Yet the reality for many doesn’t match the expectations. Many of us are estranged from family, struggle to pay the bills, wrestle with addiction, face health challenges or worry over the future our children and grandchildren will inherit. There is a lot of darkness in the world. This is true. Yet our faith teaches that the light enters into the darkness. Light which cannot be extinguished or contained. Each year the story of Christmas comes to remind us that light has come. An unlikely light in the form of an infant, born to peasant parents, during a time of military occupation. This child born homeless, wrapped in rags and placed in a feeding trough. From this humble beginning a life-sustaining light has come. A light which still burns. A light that rests upon each woman, man, girl and boy. This is why we sing. To remind ourselves and those we sing to, that darkness never has the final word. The light has come, once again. Let us raise our voice in song. You’re preachin’ to the choir (director)! And, God bless choir directors too. I was on the other side of caroling this week. We were bringing my mother home from rehab after a hospital stay. While we waited for the discharge process to roll along, a group of carrollers from Sanford High School began to sing. And I cried. And just did again. Christmas has never been hard before, I never fully understood the work of the carrolers….